IEM Katowice plus top CS:GO, LoL, Smite and more! 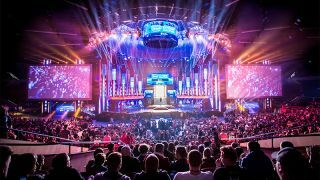 The Intel Extreme Masters in Katowice, Poland opens its doors this weekend and there’s plenty of esports action to indulge in. There’s drama from the Heroes of the Storm: Western Clash to the CS:GO World Championship. We even have week three of the Smite SPL to look forward to. All the details on this weekend’s events can be found below. Three of the highest-ranked teams from HGC North America, Europe, Latin America and Australia/New Zealand will duke it out for their share of the $100,000 prize pool. Teams will clash in a double-elimination format and we will see if anyone has what it takes to dethrone Misfits this weekend. In addition to all the competitive gameplay, a new hero will also be displayed during today’s event. You can check out the standings for each region and view the tournament schedule for your area over on the Heroes of the Storm’s official site. The World Championship is set to be the final StarCraft 2 event of IEM Season XI, as well as the first global event of WCS 2017. A chance to grab a place in the global finals at BlizzCon this year will be given to the winner, as well as $250,000 prize pool. The competition is looking extremely fierce, with 76 challengers facing off to claim the crown. Group C will kick things off today at 03:00 PST / 12:00 CET and continue throughout the day. You can check out the full schedule here, while the stream can be watched over on Twitch. The group stage matches of group A and B have concluded and FaZe Clan has won their place in the semi-finals, while Natus Vincere took the lead in their bracket. Teams that secured second and third place will duke it out in the quarterfinals, but only the strongest will have a chance to snag the $250,000 prize pool. The quarterfinals start today at 03:45 PST / 12:45 CET, while the semifinals begin the following day at 03:30 PST / 12:30 CET. You can check out the full schedule here, while the stream can be watched over on Twitch. G2 Esports remain strong after they took both games against Unicorns of Love in week five. They starved UoL of objectives and gold in the first game, while the second game was won thanks to a game-changing quadra kill from Zven. Splyce has improved tremendously and Kobbe’s Jhin was the star of the show going 8/1/9 against Fnatic. The competition is heating up as we enter week six of play and Misfits are still looking to rival G2 for first place. This week’s schedule and stream can be found over on LoL Esports. Team SoloMid dominated Cloud9 in week five and their early game has greatly improved since the start of the LCS. Bjergsen’s Zed and Hauntzer’s Shen showed excellent control and synergy in game three, which gave TSM an early advantage that allowed them to push for the win. FlyQuest suffered an unexpected defeat against Dignitas when Hai decided to pick Jarvan mid, which made it all too easy for Dignitas to play around. Team Liquid also suffered a heavy defeat in their game against Counter Logic gaming, but they still have a chance to show improvements when they face Immortals today. The full schedule and stream can be found over on LoL Esports. We’re more than halfway through the Overwatch APEX Season 2 now and it has been a rough ride for the Western squads. However, Team EnVyUs still have a shot to claim a win for fans when they face Lunatic-Hai today at 02:00 PST / 11:00 CET, while Team KongDoo Uncia face RunAway at 03:30 PST / 12:30 CET. The competition continues to ramp up and the $178,000 prize pool is beckoning for a victor. You can find the official stream over on Twitch. The third week of the SPL will continue this Saturday where CycloneGG and NRG eSports will clash. Team Eager are the current leaders in North America, while Valance Squad are the dominant team in Europe. NRG will be looking to secure a win after Obey Alliance delivered a shocking blow when they beat them 2-0 and took second place. CycloneGG is currently at the bottom of the rankings alongside Sanguine Esports, so expect to see the underdogs going all out in this matchup. You can find the weekend’s schedule and official stream here.